These potatoes still taste buttery and rich but are much lighter than the full fat version by using a small amount of butter to saute sweet leeks and some chive flavored reduced fat cream cheese. 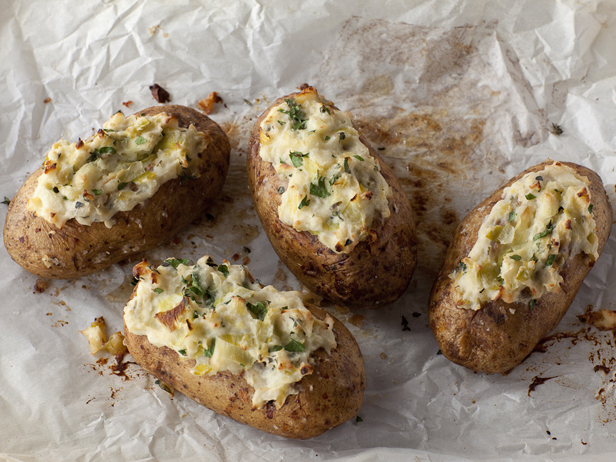 Preheat the oven to 375 degrees F. Rub the potatoes with the oil and season generously with kosher salt. Place on a baking sheet and bake until the potatoes are very tender on the inside and crisp on the outside, about 1 hour, 15 minutes. Let stand 5 minutes. Meanwhile, heat the butter in a large nonstick skillet set over medium heat. Add the leeks and season with salt and pepper, cook until soft, about 6 to 8 minutes. Add the garlic and thyme and cook until fragrant, 1 minute. Cool slightly. Add the leek mixture, cream cheese and milk to the potato and mash well with a fork until combined but slightly chunky. Stir in the chopped parsley. Spoon the filling back into the potato shells, about 1/2 cup of filling for each potato and place back on the baking sheet. Bake until heated through and the tops are lightly browned, 20 to 25 minutes. Garnish with extra parsley.